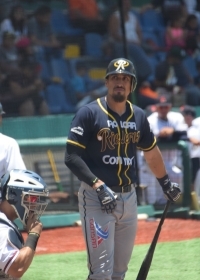 The Rieleros (Railroaders) de Aguascalientes (52-38) defeated the Bravos de León (34-50) 8-7 at Estadio Domingo Santana in León on July 16. It took over four hours to play this game. Neither of the starting pitchers got through the third inning. The Rieleros used eight pitchers, and the Bravos used seven, despite the fact that both bullpens were depleted by the double-header the previous day. This game was close all the way. The winning run came on an RBI single by 1B Jesus Castillo in the top of the sixth inning, and it put the Rieleros ahead 8-6. The Bravos stranded a baserunner on third in the bottom of the seventh. With one out in the bottom of the ninth, 2B Gilberto Mejia hit a ball down the right-field line to the fence that was just foul. A couple of pitches later, he hit a ball down the left-field line that was almost to the fence, and just fair, but it was caught by LF Amilcar Gomez for the second out. 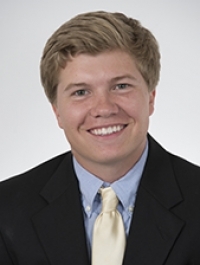 However, the next batter, CF Junior Lake, was hit by a pitch, and he went to second on defensive indifference. Lake then scored on a single by 1B Dan Johnson, and it was a one-run ball game. However, DH Carlos Valencia, after a long turn at bat, flied out, ending the game. The Bravos got off to a good start. They ended the top of the first with a double play. LF Eduardo Arredondo led off the bottom of the first with a single. Mejia followed with a double, and Arredondo scored on a ground out by Lake. Johnson then hit a sacrifice fly to score Mejia. Pick Round Team Player Story School Pos. 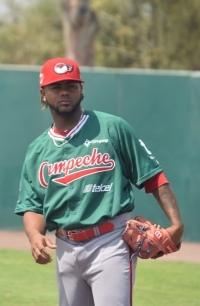 The Piratas de Campeche (24-32) swept a double-header against the the Bravos de León (19-37), 8-1 and 4-2, at Estadio Domingo Santana in León on June 4. First game: RHP Rolando Valdez went the seven-inning distance for the Piratas, allowed eight hits, walked one, struck out four. The Piratas got all the runs they needed in the top of the first inning. They loaded the bases on Bravos starter RHP Alfonso Sanchez with a walk, a base hit by DH Frank Diaz, and another walk. Sanchez then hit SS Paul Leon with a pitch to open the scoring. The next batter, LF Maxwell Leon, bunted for an RBI and the winning run. 1B Fernando Flores hit a double to score two runs, and RF Roberto Valencia hit a double to score another run. Sanchez didn’t allow another hit until the fifth inning, when Diaz led off with a double. 3B C.J. Retherford followed with a home run. Sanchez walked the next batter, and was relieved by RHP Fredy Quintero, who gave up a single, then a double-play ball. Leon completed the scoring with home run in the seventh that went a long way over the left field fence. 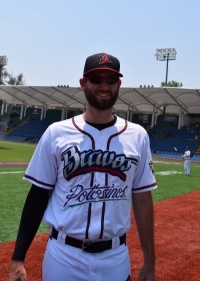 The Bravos de León (17-34) trailed the Sultanes de Monterrey (36-13) 4-3 going into the bottom of the eighth inning, but the Bravos got three solo home runs in the bottom of the eighth for a 6-4 win at Estadio Domingo Santana in León on May 28. The deciding inning started with a fly out. Then, 2B Carlos Valencia hit a home run to left field. The next batter, RF Brandon Macias, hit another home run to left field, and that one got out of the ball park in a hurry. The Sultanes replaced RHP Marcos Rivas with LHP Edgar Torres. Torres recorded a strikeout, but the next batter, C Marco Chicuate, completed the scoring with yet another home run over the left field fence. The Bravos sent in their closer, RHP Craig Stern, to pitch the top of the ninth, and he retired three of the four batters he faced. The Bravos out-hit the Sultanes 14-7, but missed some opportunities in the early going. A single by Valencia in the third inning scored a run, giving the Bravos a 3-1 lead, but SS Niko Vasquez was tagged out at third; a review of the play upheld the call on the field. After a fly out, Valencia went to second on a single by 1B Leslie Anderson. The next batter, Chicuate, hit a single to left field, but Valencia was tagged out at home after a excellent throw by LF Zoilo Almonte. The Sultanes opened the scoring with a run in the top of the first without a hit. CF Chris Roberson led off with a walk, went to second on a wild pitch, stole third, and came home on another wild pitch. The Bravos answered with a run walked in, RBI to Valencia. However, the Bravos left the bases loaded when Macias struck out. The Bravos got a runner on first in the bottom of the second, but 3B Agustin Murillo made a great catch of a line drive to prevent any damage. The Sultanes tied it 3-3 with a two-run home run by Murillo in the top of the fourth. They went ahead 4-3 with a home run by Almonte in the sixth. They were kept off the board the rest of the way by relievers RHP Mitch Lively (seventh inning, one hit), RHP Gerardo Sanchez (eighth inning, no hits), and Stern. Science and Arts of Oklahoma (Chikasha, OK) is making their second appearance at the Baseball National Championship. They went two-and-out last year, and were taken out by The Master's. The Drovers win the United Nations award for the second straight year; they have an Australian, five Puerto Ricans, and a Dominican Republican. Top position players: UTL Christian Perez (.434, 10 HR, 59 RBI, Bayamon, Puerto Rico), RF Randy Ventura (.429, 10 HR, 52 RBI, Carolina, Puerto Rico), C Dillon White (.410, 15 HR, 80 RBI). 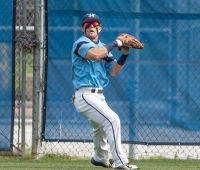 White's 80 RBI are fifth-best in the NAIA. Top pitchers: LHP Francis Ventura (10-1, 1.64 ERA, 88 K), LHP Jose Hidalgo (9-1, 2.04 ERA, 85 K), RHP Ruddy Estrella (1-1, 2.49 ERA, 29 K), LHP Carson Korff (8-0, 2.56 ERA, 52 K). Ventura's ERA is third-lowest in the NAIA, and lowest of the pitchers in this tournament. Hidalgo's ERA is 15th-lowest. Outlook: The Drovers had to beat a really good Bellevue team twice and a good Davenport team to get here. This is a tough first round matchup for both teams. 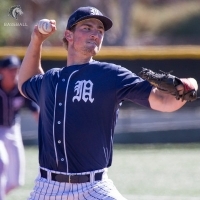 The Master's (Santa Clarita, CA) is making their fourth appearance at the Baseball National Championship. They went 1-2 in last year's tournament. 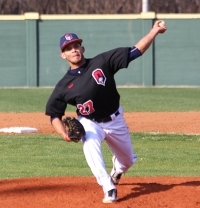 The win was 6-1 over Science and Arts of Oklahoma; RHP Brad Lohse pitched a complete game. They won the Golden State Athletic Conference tournament by winning five straight after losing the opening game. Quality wins: 4-1 vs. Menlo, 2-0 vs. Georgia Gwinnett. Defeated Hope International twice in GSAC tournament. Outlook: After a slow start, the Mustangs went 24-4 since March 25, and enter this tournament with a nine-game winning streak. Preview from The Master's College. 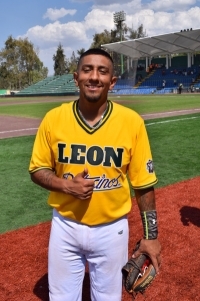 2B-3B Brandon Macias batted in five runs to lead the Bravos de León (11-20) to a 12-3 win over the Olmecas de Tabasco (10-20) at Estadio Domingo Santana in León on May 6. This was the first game for the Bravos' new manager Luis Carlos Rivera and new pitching coach Ray Loya. It was also the first game for 1B Leslie Anderson, who went 2-for-4 with a double, an RBI, and three runs scored. The Olmecas opened the scoring with a run in the top of the first on a triple by CF Yordanys Linares, who scored on a single by DH Sandy Madera. Olmecas starter LHP Carlos Teller didn't allow a hit until the forth inning. With two out and the bases empty, he walked LF Alfredo Marte. Anderson got the Bravos' first hit of the game. Teller then walked Macias to load the bases, then hit DH Joshua Banuelos to tie the game. The next batter, 3B Miguel Torrero, hit a two-RBI single, and the Bravos led 3-1 after four innings. The Bravos got a "small ball" run in the fifth. CF Sergio Garcia opened the inning with a single. He moved to second on a hit batter (Teller hit three of them), and third on a line drive out. He then scored on a sacrifice fly by Marte. Teller was relieved by RHP Rodolfo Aguirre after walking the next batter. NAIA coaches' poll for May 2, 2017, with Boyd Nation's ISR. Recaps below. 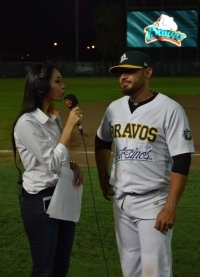 C Israel Nunez hit a two-RBI single in the bottom of the seventh inning to break a 4-4 tie and give the Bravos de León (9-12) a win over the Toros de Tijuana (14-7) at Estadio Domingo Santana in León on April 23. Nunez was followed by SS Hector Hernandez, who hit an RBI double to make the final score 7-4. RHP Edwin Quirarte to0k the mound for the Toros at the start of the deciding inning. He retired the first two batters he faced, and didn’t retire another one. With two outs and the bases empty, he walked the Bravos’ leading hitter, LF Alfredo Martes. 3B Miguel Torrero hit a single to move Martes to third, and DH Adam Munoz walked to load the bases for Nunez. It was Martes who scored the winning run. Neither of the starters, LHP Miguel Pena for the Toros and RHP Fernando Villalobos for the Bravos, made it to the fifth inning. The game was scoreless going into the fourth, and Villalobos allowed only one hit over the first three innings. That changed quickly in the top of the fourth. RF Dustin Martin started the inning with a double, LF Cyle Hankerd hit a single, and 3B Alex Liddi hit a single, scoring Martin. CF Corey Brown then hit a three-run home run, chasing Villalobos with the Toros ahead 4-0, but that ended the scoring for the Toros. The Bravos answered with a two-run home run by Munoz, and another two-run home run by CF Rico Noel. The score remained 4-4 until the seventh. The Bravos got double plays in the fifth and seventh. NAIA coaches' poll for April 18, 2017, with Boyd Nation's ISR. Recaps below. NAIA coaches' poll for April 4, 2017, with Boyd Nation's ISR. Recaps below.